Last year Evolution Performance became the first to run a 2013 Shelby GT500 in the 9s, setting the benchmark with a 9.95 second pass at 142 mph at Atco Raceway in New Jersey. Now the shop in Aston, PA has once again reset the mark with an astounding 8.94 second run, becoming the first to drop below the nine second mark in 2013 Shelby GT500. Making the feat even more impressive is that the Grabber Blue Shelby’s stock 6-speed manual transmission is still in place. So what does it take to build an eight second Shelby GT500? A fully built 5.8L V8 from L&M Race Engines and tuned by Lund Racing is now under the hood, with the stock 2.3L supercharger swapped out for a Kenne Bell 3.6L liquid-cooled unit running just under 23 pounds of boost. In total, Evolution Performance’s Shelby produces 1,156 horsepower and 1,078 lb-ft torque at the rear wheels. All of that power runs through a Spec twin-disc clutch and aluminum flywheel as well as a FAB 9-inch rear end, and a set of Mickey Thompson ET drag slicks wrapped over Weld RT-S wheels help put it to the ground. 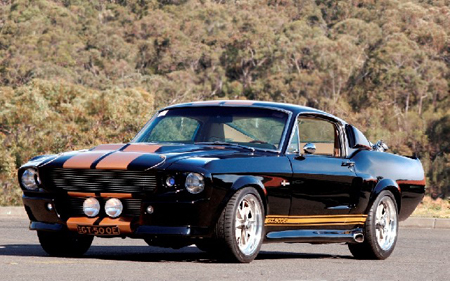 Want to see the Shelby’s eight second pass for yourself? Just click the play button below and enjoy the video in up to 1080 HD. This entry was written by by MustangsDaily (Mustangs Daily) and posted here on Thursday, May 9th, 2013 at 3:14 pm and is filed under 2013 shelby gt500, Evolution Performance, shelby gt500, Videos. This article was not written by us, rather gathered using RSS feeds listed here. We take no credit for this article. You can leave a response, or trackback from your own site.